As I gain experience, certain lessons are confirmed repeatedly in the non-vacuum that is the real world. I arrived at a location where a person had a very large, and severe laceration to his hand/arm. This was not a paper cut, but a very serious, artery severing event. The person in question had already passed out and fell to the ground from the shock of this event. The shooting/pulsating blood, which came from the area where he used to have an arterial vein was an immediate indication which required quick response. 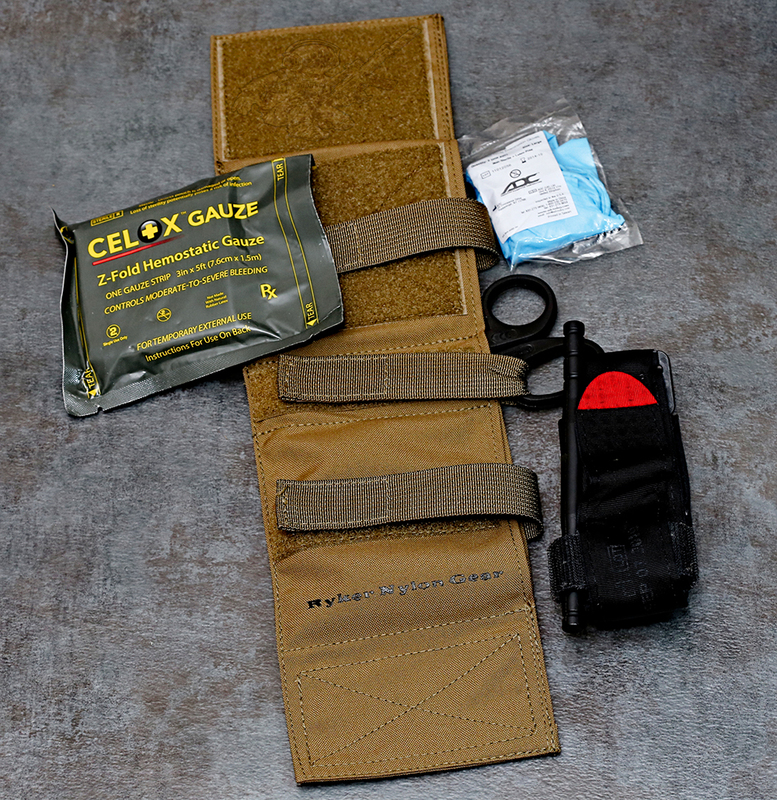 I carry several different variations of medical kit with me at all times on duty. One of which is the above Ryker Nylon Gear AFAK (Ankle First Aid Kid). In my duty gear AFAK I carry a SOF T Wide TQ , H&H Bandage , Nitrile Gloves , Medical Sheers and a HALO Chest Seal . All of the listed items I have used several times in real world applications and have a good working knowledge of their implementation. I quickly deployed the SOF T Wide TQ and began to apply it on the upper meaty part of the bicep. The squirting of the thick red blood became less frequent, but still continued. I tightened it down as far as it could go but the bleeding did not stop. A fellow officer was on scene a that time and he deployed his TQ as well. That did stop the bleeding and the person was able to be transported to a top tier level 1 trauma ER where he was successfully stabilized. While I do not normally post information about events which just occurred, I wanted to because there is a hard lesson hidden inside this particular situation, two actually. First and foremost, you have prepared and aware of what an injury looks like that may require immediate action. If I had never done any trauma training, if I had never gone out of my way to carry a TQ or other medical items, this person may have bled out right on the sidewalk. This happens often in the real world because the people coming are not always the best trained, or the most willing to act in these circumstances. Second, I only had one TQ on me at that time. In order for me to deploy another one it would mean that I would have to run back to my vehicle (which was parked down the block for officer safety reasons) and during this elapse of time the person may have bled out. The immediate stopping of bleeding is absolutely necessary in instances like this, no second can be spared. Thankfully I was not the only prepared person that evening. Ended up getting some blood on my Blauer boots, good thing they are blood resistant. Always wear gloves when you apply medical care, especially when blood is present, if you are lacking any type of training, go out and find some in this particular field. It is your responsibility to be prepared for these types of situations. Knowing that you can affect a situational positively and not acting to do is unacceptable, it is not something a responsible American citizen does. We are all responsible for our ignorance, regardless of the consequences.